I did the photo shots for this post together with Part 1 – and I also lost the close-up photos of these. Somehow I have accidentally deleted all of them except for the overview one. I’m so upset about it because for once I tried to arrange all the products nicely! So I’m really sorry if this empties post is so word-heavy with only one pathetic photo. This was a highly raved about face powder some time ago – and I promptly got it because I am not original like that. I did like it actually – I wasn’t expecting this to give much coverage but I thought that it did give some, without looking powdery. It’s also super cheap – I got during a Rimmel sale on ASOS. This is a rather weird BB cream – it’s a very grey-looking cream, and I really thought it would make me look like a zombie but no, it actually looks really good on the skin! I don’t know how it did that – maybe it’s zombie technology or maybe the grey cancels out the sallowness in my skin? This lasted well on me through the day, and I’m really tempted to purchase the full size! I do not like this. Thick, oily. Not comfortable on. Eurgh. Have used up tons of this and I do like them. Would I buy the full size? No, because I can get them in handy little sachets like this online for a lower price than the full bottle. I have to say that while Cle de Peau skincare did not wow me, I find myself rather tempted by their makeup products! Well, at least their bases – foundations, primers. I have tried their Radiant Fluid Foundation earlier and that I loved too. Only thing is – they have extremely stingy sample sizes. Adios brush. I got this in February, but it’s broken into two. I tried to reglue but it wouldn’t stay, and I don’t want to hold just one half of it. It seems a bit fast, but I’ve been using these non stop and I think they have really done an amazing job of being used and washed so consistently. This was also the only one out of 10 in the set that had this problem. If I find the store again I would gladly purchase more. I don’t know what happened – when I first got this, I really enjoyed it; great fresh-looking foundation that’s lightweight, what’s not to love? But one day, not too long later, I thought I had turned totally pink! Then I realised that it was my foundation that has turned totally pink! Perhaps it oxidised in the bottle or something else, but pink is not a good foundation shade. Texture – great. Effect – didn’t see any. Reviewed here. I like the eye cream but I think they could have lowered the price by doing away with the useless concealer side. This smells like peach which is lovely, but leaves a white pasty layer – I wouldn’t use this as a base because it basically turns you two shades lighter in the least natural way possible. I didn’t finish it but I don’t think that I will, so out it goes. Reviewed here. If I don’t already have a mountain of face scrubs, I would have repurchased this. I really have no idea what the whole “mask-in” thing is about. Feels like a regular lotion/toner. SKII products are expensive, so I expect them to deliver more. So this is pretty nice – it didn’t break me out, and dried down very quickly without a greasy layer. It’s lightweight and felt really comfortable under makeup. Reviewed here and finished the full size one here. This one came with one of the Too Faced palettes, if I remember correctly. Easily my favourite eyeshadow primer and I would definitely repurchase. Keep this far far away from me – this gave me the mother of all breakouts! I couldn’t believe it was this at first – I’ve used other Laura Mercier products and I’ve been fine. But I gave this a few tries, letting my skin heal first and every time I reintroduce this I would breakout with humongous zits. NO. I don’t know what they were thinking when they created this shade, but it’s not a good look on the lips! There’s no way I will wear it so this goes out in the trash since I’m in my throw-it-all-out mood. 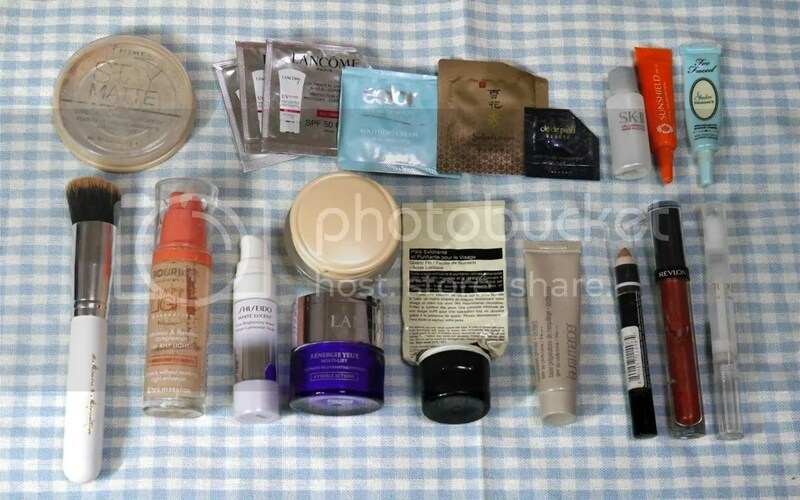 This was from Memebox Global #18, oh my memories of Memeboxes seem so far away now, but after running through a good number of products from my past Memebox purchases, I can now safely say that I am glad that they no longer ship overseas. The products are generally overpriced and underperforming. This was said to have a value of USD46… are you kidding me? This does absolutely nothing for me except for adding some oiliness to wherever that I’ve applied it. I… have had this for over 6 years. HORRORS. But to be fair, I have not touched it for 5years. I actually still have a few more tubes that are SEALED, so I’m wondering if they’re still safe to use? I might just throw them out next month, since I never liked them anyway. Rather drying on the lips and there are so many better products now to play with. And that’s it for this month’s empties! Did you use up anything? Or do you also have a miracle product that just never seems to finish?